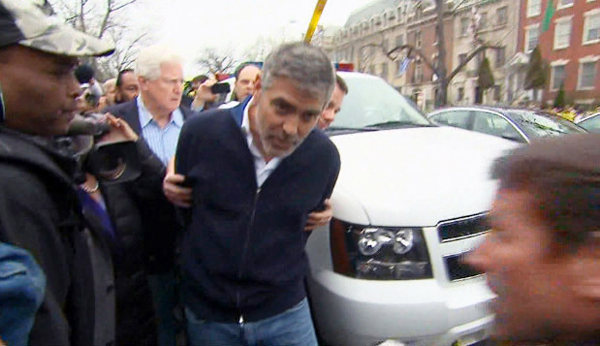 George Clooney and other activists involved in a protest on the steps of the Sudan embassy have been arrested. The protestors were calling on justice and deliverance of aid to the Sudanese people. This has just untied a whole bag of injustices and distorted liberties. George Clooney, along with several other activists, has been arrested during a protest in front of the Sudan embassy in Washington D.C. The protesters were condemning Sudanese president Omar al-Bashir for provoking a humanitarian crisis and blocking food and aid from entering the Nuba Mountains in the border region with South Sudan. The International Criminal Court (ICC) issued a warrant for al-Bashir’s arrest in 2009 on charges of war crimes and crimes against humanity. But the warrant is opposed by the African Union and League of Arab States, so al-Bashir has been able to travel between countries with ease. John Prendergast, co-founder of the Enough Project, organised a National Day of Action on Friday to stress and promote the urgency of providing emergency aid to the populace of Sudan; he was the first to be arrested. Martin Luther King III, George Clooney and his father, Nick, were handcuffed soon after. Clooney has spoken to the U.S. Senate about the dire situation in Sudan and urged the president Barack Obama to negotiate a passage of delivery of aid to the region before the rainy season starts. The protest was not violent; it was organised to advocate for Sudanese people in distress and condemn a corrupt leader who has been convicted by the ICC – a verdict the U.S. government supported. The arrest of the human rights activists is ungrounded and sends a skewed message of selective citizen liberties which are honoured by American authorities only in advantageous situations. Hopefully, the protesters will be released, so further efforts to provide aid to the Sudanese people can be encouraged. Miss Piggy wants to wrestle George Clooney!